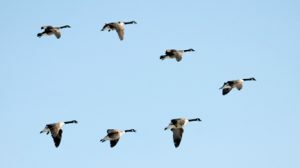 This time of year, the sight of migrating geese on their journey south reminds us of the coming changes in weather that are in store for those of us who don’t make a similar journey. It’s an amazing sight to see the flock following their leader in V formation. When the disciples made the choice to follow Jesus they wouldn’t have known what was in store for them; God’s plans for them were to become leaders and carry on Jesus’ ministry. God asks each of us to become leaders in our own way. We don’t always hear what God asks of us. Like the disciples we may need to follow and learn before we can go out on our own. Jesus came to teach us about God, his kingdom and the path of servant leadership. Jesus becomes the focal point for us as our source of eternal salvation and we live each day knowing Jesus is with us. We are called to use our unique talents to focus on others’ needs first as we continue Jesus’ work. Servanthood is about attitude and not about position. Jesus lived the ultimate example of how to be a servant leader. If you remember the story of Jesus washing the disciples’ feet, it was Jesus who washed the disciples’ feet. The last verse in Mark is a powerful reminder of Jesus’ service, ‘For even the Son of Man did not come to be served but to serve and to give His life a ransom for many.” Listening prayerfully to God’s Spirit we might hear what our way would be to serve. Jesus spent three years leading his disciples and teaching them how to continue his ministry. The disciples recognize that Jesus’ ministry of service has not been nor will continue to be an easy road. They can see that Jesus is not always “recognized” for his compassion or his healing hands and there may not always be praise from humans for his actions in the way the disciples might expect. Human attitudes, characteristics and desires haven’t changed much over the centuries. When Jesus tells them, “sit at my right or left is not for me to grant” Jesus speaks about the kingdom of God however the disciples think of the kingdom as an earthly kingdom. They can’t process the thought of a kingdom outside of what they can physically see, feel and touch. Jesus tells the disciples they are not like the rulers of the Gentiles or the high officials and says to them, “Whoever wants to become great among you must be your servant, and whoever wants to be first must be slave to all.” This isn’t the answer the disciples are looking for. To most people this wouldn’t be an easy pill to swallow. Our society urges self-importance and proposes things we need to make us feel good. Jesus’ life of service seems to lie in direct contrast to the things we think will make us happy – that is – things we can buy such as cars, bigger houses or vacations. The human approach to gain power, fame and wealth is not the path Jesus walked nor spoke of to lead us into God’s kingdom. Jesus modeled a selfless life. He had compassion for all people. He taught his disciples and teaches us that leadership is servanthood. We can take the initiative and continue Jesus’ work and strive to live a life like Jesus. We can commit to share our knowledge and compassion with others as servant leaders. The first step is to put others’ needs ahead of our own, a small step with impacting and rippling positive results. We are transitioning from following to leading. When we see a flock of geese flying in formation, it can remind us of leadership. By flying in their V-formation they are able to fly faster and farther. They communicate along the way and look after one another. They also take turns leading in formation. As Jesus showed us and taught us, it is now our time to take the lead position and help guide others along the Christian path. Jesus knew joy and sorrow, he taught, he healed and he served. Jesus suffered but was still obedient to the path God had planned. He became human and suffered to understand our plight. We read that Jesus offered up prayers and petitions with loud cries and tears to the one who could save him from death and he was heard because of his reverent submission. God sent Jesus to become human so he could speak our language and show us the way. The man in the story was not a scrooge; he was a kind, decent, mostly good man. He was generous to his family and upright in his dealings with other men. But he just didn’t believe all that stuff about God becoming a man, which the churches proclaim at Christmas time. It just didn’t make sense, and he was too honest to pretend otherwise. God sent Jesus to become one of us, to teach us and lead us to God’s kingdom by following in formation. Will you make that transition from following to leading?